The metallic (silver) circuit breakers are suitable replacements for ATO, ATC, AF, 257, and APR circuit breakers and fuses. The type II and type III circuit breakers are thin, allowing them to fit in tighter spaces. These type I circuit breakers will automatically reset after overload. 6-12 volts. These type II circuit breakers will reset after power is turned off and back on. 12 volts. These type III circuit breakers reset with a push of a button. 12-24 volts. The gold auto-reset, type I and manual-reset, type III circuit breakers are suitable replacements for Mini, ATM, AF2, 297, and APM circuit breakers and fuses. Sold individually. The type I circuit breakers will automatically reset after overload. 12 volts. The type III circuit breakers reset with a push of a button. 12-24 volts. The mini low-profile manual-reset, type III are suitable replacements for Mini Low-Profile, APS, and ATT circuit breakers and fuses. Reset with a push of a button. 12-48 volts. These metallic (silver) circuit breakers are suitable replacements for Maxi, Max, AF3, 299, and APX circuit breakers and fuses. 12 volts. Sold individually. The auto-reset, type I circuit breakers will automatically reset after overload. The power-off reset, type II circuit breakers will reset after power is turned off and back on. These high amp circuit breakers are typically used in auxilliary and accessory circuits for trucks buses RVs and marine applications. Applications include battery charging systems that use battery isolators to manage and protect batteries in multi-battery installations. Flush-mount. Has two threaded 1/4" studs, nuts included (1/4"-28). 6-42 volts. These high amp circuit breakers are typically used in auxilliary and accessory circuits for trucks buses RVs and marine applications. Applications include battery charging systems that use battery isolators to manage and protect batteries in multi-battery installations. Flush-mount. Has two threaded 1/4" studs, nuts included (M6-1.0). 6-48 volts. 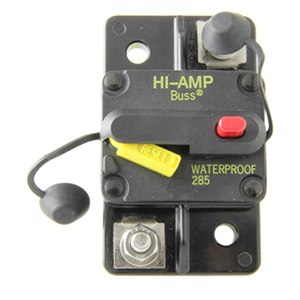 These high amp circuit breakers are typically used in auxiliary and accessory circuits for trucks buses and RV applications. Applications include battery charging systems that use battery isolators to manage and protect batteries in multi-battery installations. Panel-mount. Has two threaded 1/4" studs, nuts included (1/4-28). 6-42 volts. 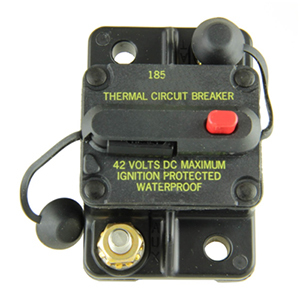 These high amp circuit breakers are typically used in auxiliary and accessory circuits for trucks buses and RV applications. Applications include battery charging systems that use battery isolators to manage and protect batteries in multi-battery installations. Panel-mount. Has two threaded 1/4" studs, nuts included (M6-1.0). 6-48 volts. Created for the marine industry, these 6-48VDC circuit breakers offer low voltage and high amperage protection in the most demanding environments. These type III circuit breakers reset with a push of a button. 12-48 volts. Sold Individually. Stud size 5/16-18. Blades are 1" apart to fit Mack breaker format. These type II circuit breakers will reset after power is turned off and back on. 6-12 volts. Sold individually. These metallic (silver) stud style circuit breakers allow you to easily attach your wire to these circuit breakers. 6-12 volts. Standard body measures 1.3" lg. X 0.8" wd. X 0.6" ht. and has two 10-32 threaded studs. Narrow-profile body measures 1.1" lg. X 0.4" wd. X 0.6" ht. and has two 10-32 threaded studs. The narrow profile allows you to fit more in tight spaces. These type I circuit breakers will automatically reset after overload. These mounts allow you to easily mount stud style circuit breakers (CB-10 thru CB-50). Mounts two circuit breakers with the studs up (turtle). Sold Individually. These circuit breakers are suitable replacements for 1/4" X 1-1/4" AGC, MDL, GDL, GGC, 312, and 313 glass fuses. These type II circuit breakers will reset after power is turned off and back on. 6-12 volts. Sold Individually. The 6-12 VDC circuit breakers are suitable replacements for 1/4" X 1-1/4" AGC, MDL, GDL, GGC, 312, and 313 glass fuses. The low profile allows them to fit in tight spaces. These type II circuit breakers will reset after power is turned off and back on. Sold Individually.